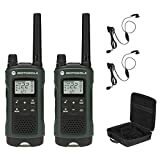 Amazon has the motorola talkabout T465 Rechargeable Two-Way radio bundle (green) for $94 with free shipping. Sells for $94+ Highest Price. Deals for $89 Lowest Price. Normally $92+. 22 Channels each with 121 Privacy Codes. With 22 channels and 121 privacy codes, totaling 2,662 combinations, it is easy to find an available channel.